Manifold Size : 4" to 8"
Back-flushing pressure is 1 bar. Back flushing process is completed in automated manner. Water supply is not interrupted during back flushing process. As it can be cleaned within short time, very low amount of water is used in back flushing process. Due to discs with varying dimensions, desired filtration degree is ensured. Maintenance during operation is very easy. 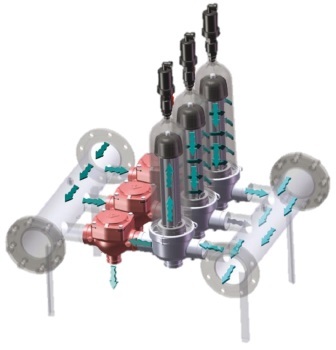 As it is used in modular filter systems, filtration at desired rates can be performed. Due to body and framework reinforced against corrosion, it has long operation life. 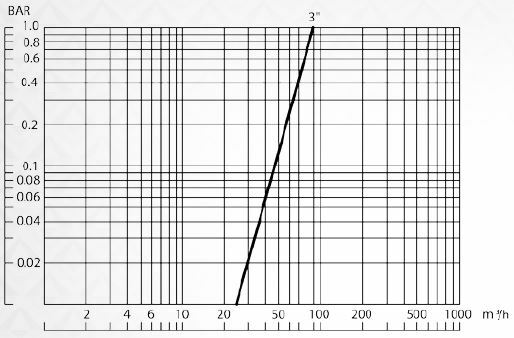 What is included in a set with 2 units of filters? We offer 1 pcs of FREE Armas Plastic Pressure Sustaining Valve (4" - Flange Connection) with this set, in order to increase reliablity of the complete system. AutoFlush® Automatic Plastic Disc Filter is constructed by assembling many tiny synthetic disc manufactured from polypropylene material on filter body with telescopic structure. When synthetic discs arranged one-on-other are centralized around within telescopic filter body, center of discs forms a hollow disc. They are designed to perform a deep filtration based on desired micron level found on both sides of synthetic discs and inter-sectioning of channels designed in crosswise manner. Most outstanding advantage of AutoFlush ® Automatic Plastic Disc filter is that automatically self cleans the filter when it is obstructed. AutoFlush® Automatic Plastic Disc Filter operates in two different modes including filtration process and back flushing process. In back flushing process of AutoFlush® Automatic disc filter, internal mechanism of filter, where synthetic discs are assembled, is automatically flushed. 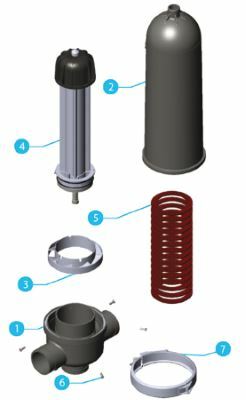 During cleaning process, no need for assembly and disassembly cycle of filter’s internal mechanism ensures continuousoperation. 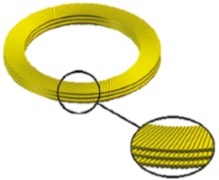 Many synthetic discs assembled on telescopic filter body create a hollow cylinder. Those discs assembled on the filter body are compressed using spring force and water pressure. Due to above mentioned arrangement of discs, many crosswise water channels intersecting each other are formed between two discs. Polluted water supplied from inlet pipe of AutoFlush® Automatic Disc Filter is transferred on discs due to cyclone effect arising from centrifuge wing found on filter body. The polluted water supplied as mentioned above passes from crosswise water channels and it is filtered depending on filtration degree. 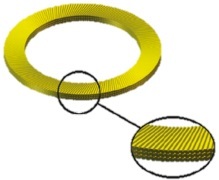 Particles with diameter larger than channel diameter of the disc attach to exterior surface of discs. Filtered clean water progresses from hollow section of discs and thus, clean water is supplied to the system from clean water pipe of the filter. As pressure resistance of discs involved in AutoFlush® automatic plastic disc filters shall cause no change on filter surface, efficiency to trap solid particles will be very high. Throughout filtration process, synthetic discs will be obstructed at a particular time due to filtration of polluted water containing particulate matter. 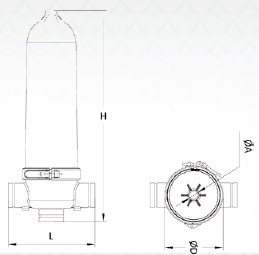 Back flushing process of AutoFlush® automatic disc filters connected parallel to the system is time- dependently started using pressure gradient (DP) sensor or a control de- Groovede. The filtered clean water is supplied in reverse manner along telescopic filter body from the clean water pipe of AutoFlush® automatic disc filter. Pressure of back flushing water elongates distance between discs by removing spring force on the synthetic discs. Pressure clean water is sprayed from nozzles on filter body to the crosswise channels of discs. Due to spray of pressure clean water, particles previously attached to the channels of synthetic discs are cleaned and discharged. Back flushing process is completed within short time such as 15-20 seconds. Thus, coupious amount of water is not used for flushing AutoFlush® automatic disc filter, as the case for other filters. At the end of the back flushing process, filter is shifted to filtration position. 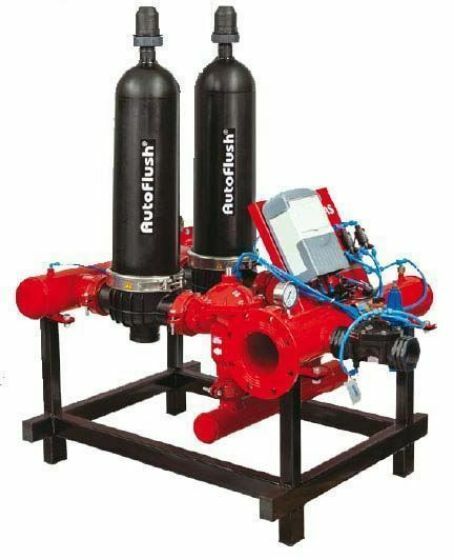 Back flushing control valves adjusting filtration and back flushing positions of AutoFlush® automatic disc filters connected parallel to the manifold collector system are programmed by differential pressure sensor (DP) for pressure and by control device for timedependent parameters.